Your iPhone’s Mail app works like most e-mail programs. Terms we’re familiar with for printed material delivered to our homes and offices — mail, inbox, carbon copy — are used to describe electronic material that is delivered to our homes and offices via computers, iPhones, and other devices. This article starts by explaining how to create and send a message, and follow up with replying to, forwarding, filing, and deleting messages. One of the great things about the Mail app is its flexibility and bandwidth. It’s the backbone for sending so much more than just e-mail messages. Apps often have an action button that allow you to send information from Mail. Open the app you want from the Home screen. Write the note, go to the address, web page, song, or app. In Photos, open the Collection or Album you want, tap Select in the upper right corner, and then tap the photo (or photos) you want to send. Tap the Action button at the bottom of the page. A New Message opens with the cursor is blinking in the To field. Address the message as explained previously. Type a subject and write something in the message field, if you want. Tap the name of the sender or one of the other recipients of the message. 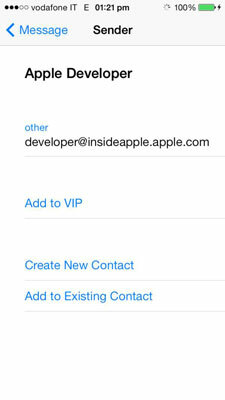 A screen opens that gives you an option of creating a new contact or adding this e-mail address to an existing contact. Tap a sender’s name to add that person or company to the VIP list. Any incoming messages from that address automatically go to the VIP inbox so all your most important messages are grouped together. Phone numbers, e-mail addresses, and website addresses that appear blue and underlined are active links. Tap the phone number, and an option of calling that number appears. Tap the e-mail address, and a New Message screen opens. Tap a website address to open the page in Safari. Tap Hide/more, next to the sender’s name, to hide or show the recipients of the message. When there are a lot of recipients, it’s helpful to tap Hide so you can see more of the message in the opening screen. If you receive an invitation from a calendar app that uses the iCalendar format, tap on the file and the Event Details open. Tap the Add to Calendar button at the bottom of the screen and then choose the calendar where the event should be inserted. For more details about sending and receiving event invitations. Zoom in on the message by spreading two fingers on the screen. Even if you have only one e-mail account, you may want to see more than what the default Mailboxes list shows you. When you tap Mail on the Home screen, the first screen that opens shows a list of inboxes and a list of accounts. Your account, or accounts, contain more than just the inbox. The screen appears. Blue circles with white check marks indicate the mailboxes that you see. Tap an empty circle, such as that next to Unread, to add that mailbox to the Mailboxes list. Tap and drag the rearrange button to move a mailbox higher or lower on the list. Scroll down to the Add Mailbox option and tap it. If you have multiple accounts, you see a list of your accounts; tap the one you want to work with. The list of mailboxes for that account appears. Tap the mailbox you’d like to see added to the Mailboxes list, Drafts for example. You now see that additional mailbox in the list with a check mark next to it. You can choose All Inboxes to see a chronological list of all the messages you’ve received. Tap an account-specific inbox and you see a list of messages from that e-mail account only. 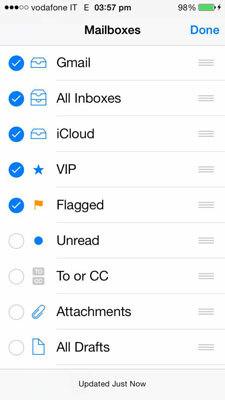 From within a mailbox — it can be All Inboxes, a specific mailbox, or even the Trash box — tap the status bar at the top of the iPhone screen or scroll up until you see the Search field. Tap in the Search field. Type in the word or phrase you are searching for. Mail searches the address and subject fields as well as content of messages within that mailbox, including the trash and junk files. Tap the message or messages you want to read from the list that appears.